I got a leisurely start today. My friend Breana gave me a ride back to the trail from Portland. 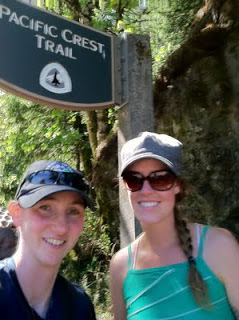 We stopped at Trail Days at Cascade Locks before we started hiking. Trail Days is kind of like a small festival or gathering every year for anyone involved or interested in the PCT. It is also a good gathering of current and past PCT hikers. We dropped by and it was still early before all the hikers arrived, but we got to see Stumbling Goat, Thumper, Little Jimmy, Jimbrick, and Headbanger. It was great to see people I hadn’t see since the Sierra. We also caught Liz, Funyan, and Meow Meow at the grocery store and visited before heading over the Bridge of the Gods into Washington. The Columbia River Gorge is a Mecca for wind surfers and it was definitely windy going over the bridge. It is a pretty exhilarating way to enter Washington. We got a couple pics, but it is difficult to calmly take it in with the strong winds, frightening heights, and many cars narrowly missing you. Once we got to the other side, another friend of mine, Linda, was there to greet us. She wanted to be there to wish me luck and see me enter Washington. She also gave me an inspirational bandana that she had made. Thank you for cheering me on Linda! I’m bummed I didn’t get you in the picture with me. I was so excited about entering Washington, I forgot to take a picture with you! It was well after 1pm and I finally got back on the trail. Breana joined me for a few miles and it was great to have company. I’ve been in a bit of a solo pocket and will continue to be because of Trail Days. There probably aren’t going to be any hikers within a day ahead or behind me for a bit. I’d really like to hike with Liz, Funyan, and Meow Meow, but they won’t leave til tonight or tomorrow and are resupplying off trail a few days before I plan to. I have felt good about going on my own and I need to keep the momentum going. I feel like I need to take advantage of every nice day in Washington and be thankful for each dry mile I get. I know the weather can change quickly and I am hoping for as many dry days as I can get! If I get lonely or want to hike with people, I know I can just stop or slow down and they won’t be far behind. I know it might make my journals less exciting, but I really like this solo thing right now. We’ll see. The hike in was slow going. I had a fresh pack with six days of food and there was a strong uphill climb most of the day. I was glad to get it done today. Along the way, I talked to some day hikers and also some people who follow the journal. It was really nice to meet and talk to them so hi to Dennis, Linda, and Libby! Libby was even running the Bonneville 50k that ran southbound on a section of the the PCT today. Way to go Libby! As I hiked, it quickly felt much more remote. Washington has always scared me a bit with it’s large dense forests. They are much darker and wilder to me sometimes. I even thought back to my practice hike last year through here. I was pretty freaked out to be alone out here. Now, I’m doing it voluntarily and enjoying it! That’s huge for me because I never wanted to do Washington alone before. It still worries me with the unknown Cascades, but I’m really feeling confident and proud of how much I’m comfortable doing on my own now. The timing worked out that I was able to stop at a camp spot that was indicated on the map and that is always nice. I was happy to surprisingly see two other hikers there. One was a section hiker I had met at Three Fingered Jack named Chunks and a true thru hiker named Yankee. It was great to see another true thru who I hadn’t met before. Yankee was just behind me all this time and it’s great to have some possible company on this leg. Yankee is great! He is in his 50s, wears a Yankee cap, has a New York accent, and listens to Yankee games on his satellite radio. Love it! We are going to get going about the same time tomorrow and see if our hiking paces match enough for the day. It will be nice to have someone new around.